A vacation that encompasses all things Australian: an island paradise in the heart of the Great Barrier Reef on Hamilton Island and an island teaming with wilderness, koalas, birds, seals, penguins and its namesake, Kangaroo Island. Enjoy dinner and a movie, cross the International Date Line. Your flight left in the evening, but as the sun comes up you’ve skipped DAY TWO. Stylish Sydney…a cosmopolitan international city filled with vibrant life, character and a sense of daring. The multiculturalism means a wealth of amazing dining experiences. While you will find all the icons you know, such as the Opera House and Harbour Bridge, you will also find interesting people, cultural vibrancy and a positive spirit. You’ll stay 3 nights in a downtown 3½ star hotel within easy walking distance to all the action. Enjoy a morning Panoramic Sydney Sights tour. Visit the historic Rocks and hear of the early convict history. Enjoy magnificent views of the Sydney Opera House, see Sydney Harbour Bridge and the shopping heart of the city including the Queen Victoria Building and Sydney Tower. Visit Sydney's trendy district, Oxford Street and elegant Paddington with its terrace houses. Arrive at the famous beaches - see Tamarama, Bronte and stop at the Bondi beachfront to stroll and enjoy a morning coffee or tea (at own expense). See surfers, famous Aussie lifesavers and Sydney's most spectacular panoramic viewpoint. Return to Sydney via Sydney Heads lookout, Watsons Bay, Kings Cross and Mrs Macquarie’s Point for unsurpassed views of the Harbour Bridge and Opera House. Tour concludes at approximately 12.00 noon. This afternoon enjoy a cruise on Sydney Harbour. This one hour cruise glides by the harbour's major attractions including the Sydney Opera House and Harbour Bridge as well as Fort Denison, Shark Island, Watsons Bay and Circular Quay. Featuring commentary that will cover the history of the harbour as well as present day sights of interest. In this quintessential aquatic wonderland, you can revel in the very best of everything that is great about Australia: glorious warm weather, azure waters, brilliant white beaches, awe-inspiring coral reefs, fascinating flora and fauna, 12 miles of bushwalking trails, fine food and wines, laid back luxury, unpretentious service, and activities almost too numerous to mention. Your Reef View Hotel room features is extremely spacious and well appointed with private balcony. Includes complimentary seat in coach airport or marina transfers, use of non motorized water sports including catamarans, sailboards, paddleboards, snorkeling gear, bushwalking, use of the fitness centre, squash and tennis court and unlimited use of the resort shuttle between 7:00am and 11:00pm daily. The state’s capital, is beautifully positioned on the Torrens River with stunning beaches to the west and the lush Adelaide Hills to the east. Adelaide offers café-lined streets, leafy parklands and a colorful calendar of festivals and special events. Spend time exploring the city’s distinctive architecture and be sure to visit the Adelaide Casino to see what was once the Central Railway Terminal. Visit the colorful Central Market, excellent Immigration Museum and take a tram to explore the beach resort of Glenelg, only 20 minutes from downtown. At 9.30am join your coach to commence a morning tour of Adelaide. Begin your orientation of Adelaide with a tour around the central business and shopping district. Pass the State Library and Trinity Church, Adelaide's oldest church, before arriving at Haigh's Chocolate factory (not open Sundays). Enjoy a brief tour, a complimentary tea or coffee and some chocolate samples. The tour continues out to the seaside town of Glenelg where there is free time to look around. You may decide to stay and spend the afternoon at Glenelg, then return by tram to the city (own expense) or continue on the coach back to the heart of Adelaide. Tour concludes at approximately 12.15pm. A coach will pick you up from your hotel to commence a full day Kangaroo Island tour. Journey south through the rolling hills along the Fleurieu Peninsula coastline to Cape Jervis to board the Sealink ferry for the crossing to Kangaroo Island. On Kangaroo Island you’ll travel to Seal Bay for a guided walk along the beach among a wild colony of rare and endangered sea lions. Travel to Vivonne Bay for lunch. After lunch journey to Flinders Chase National Park, home to numerous native animals including kangaroos, wallabies and koalas. The tour of the park will take you to the rugged southern coastline for a walk on Remarkable Rocks and Admiral's Arch. Admiral's Arch boardwalk takes you down a rugged cliff face to reveal this spectacular rock archway, a natural nursery and safe haven for New Zealand fur seals. Final stop is at Hanson Bay Sanctuary for a walk among Eucalypt trees to look for koalas. Travel back to Kingscote for your overnight stay. 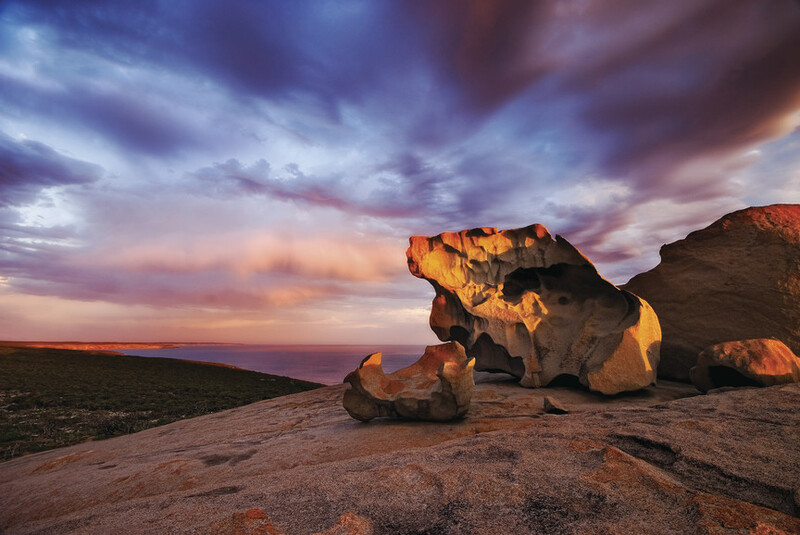 A full day at leisure to enjoy Kangaroo Island or add a second day of touring (additional cost). Return to Penneshaw to board the ferry to Cape Jervis, to connect with coach transfer back to Adelaide. Tour concludes at approximately 10.40pm, at which time you will be dropped off at your accommodation.